Remember the famous Christ figure hanging from a helicopter over Rome at the beginning of Fellini’s La Dolce Vita? Imagine a kindly old lady named La Befana flying over the Vatican on a broomstick and using the guise of a Santa Claus like gift giver, covered in ash from all the chimneys she descends, to ferret out the baby Jesus. The Feast of the Epiphany, which in Italy is called La Befana, occurs on January 6th. 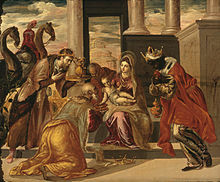 It’s called Three Kings Day elsewhere and celebrates Christ becoming human. Naturally La Befana is a major holiday in Italy and almost all the businesses in Rome close down for la feste. But one of the ways God takes on a human form in the Eternal City is through exercise and on a sunny morning the trails adjoining the Villa Doria Pamphili, the biggest landscaped park in Rome, is filled with runners and bikers. The ancient Villa Doria Pamphili's topiaries, which look like swirling snakes, bear a resemblance to those which surrounded Jack Torance’ villa, the Overlook Hotel, in The Shining. The grounds also reverberate collective memory as they were the site of Garibaldi’s initial victory over the invading French army, a victory both for the Italians and for the idea of unification or Risorgimento. Many Romans enjoying La Befana in the Pamphili gardens will undoubtedly ascend the Via Garibaldi up to the top of the Gianicolo, passing the dramatic archway memorializing Garibaldi at the Porta San Pancrazio and then take the Via Aurelia Antica which leads to one of the main entrances of the gardens. Celebrating La Befana in Rome is nothing short of epiphanic.